“I propose a different way of creating public green areas in Lima - where individuals can reconnect with nature and communities can strengthen nourishing relationships." Plantón Móvil is a walking forest that peacefully claims its place and respect in the city by linking art and social change. Since 2010 people from different disciplines and backgrounds have come together to help create and maintain sustainable public green areas. Today, this moving green is branching out towards the collaboration that will allow it to reach more people in a deeper and more lasting way. In Spanish, «Plantón» is the word for sapling. It is also the word for sit-in. This project takes on both: the green to be planted and the peaceful protest. 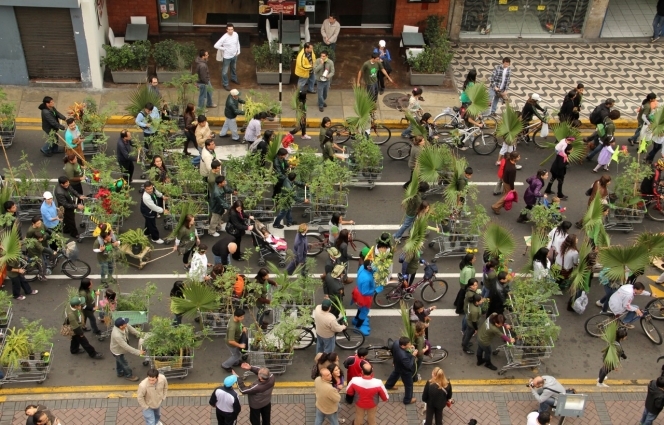 People of all ages are invited to think of a creative and non- polluting way to transport a plant, and together we form a great green mass that moves alongside city buses and busy agendas. However, there is a difference between carrying a plant and being a plant. Plantón Móvil is not a group of people carrying plants: we are the forest. This is important because it changes the nature of the gesture. It is about lending your body to this other being so that it can borrow your mobility. This project activates a connection with environmental issues that lands beyond the eco-trend, into our everyday practices. It is about taking responsibility on a daily basis and being respectful and aware of the green that cohabitates with us by putting ourselves in their shoes (in this case roots). At the end of each walk, the plants, always native or adapted to our desert conditions, are donated to help create a public green area. These are spaces where I hope, people can build and share a sense of community that includes our nonhuman kind.